Feeling thirsty? There is nothing more revitalizing than real lemonade with fresh slices of lemon. With the temperatures still close to 90F (32C) here, it’s been my favorite drink to quench my thirst on a hot summer day like this. Sitting on the grass in the shade of a tree, sipping lemonade and pampering myself with some little sweet treats and fresh strawberries is the picture I want to take with me on a journey into the approaching fall season. So why not to wear “lemon” from feet to ears? 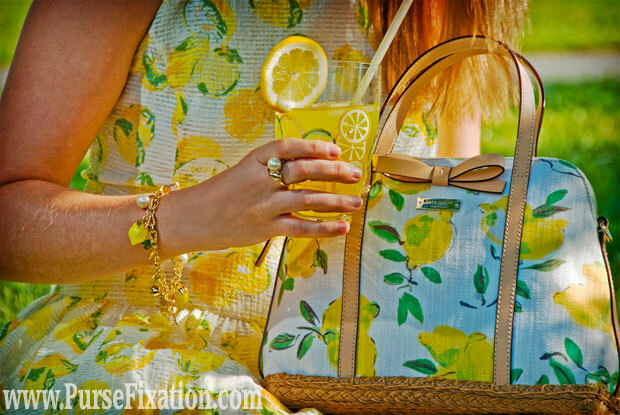 For my picnic with lemonade, I squeezed a Kate Spade Capri Espadrille Maise satchel (similar). Remarkable summer purse with an exquisite splash of citrus on the coated cotton canvas. I love this painterly quality of the lemon print, structured dome shape and beautifully woven bottom. The handbag features an unexpected yet exceptional mix of fabrics and textures: cotton canvas, vachetta leather trim and braided jute structure. A cute bow and a removable crossbody strap make this bag a perfect summery carryall. Talking fabric: vachetta is an untreated leather, popularized by Louis Vuitton and used in the trimming of handbags. Since it’s untreated, it’s susceptible to water and stains, therefore products made of vachetta leather need a special care. Over time, the material will get darker, more brownish, become suppler to the touch and develop a “patina”- natural toning quality. It’s a long aging process and it occurs naturally with normal use/wear for months or even years until you will be able to notice the first signs of developing patina. I didn’t carry my Kate Spade purse many times so I haven’t noticed any signs of patina yet and the handles are still quite stiff. I don’t know how dark the leather trim will get with time but right now I enjoy the light brown color of it. To complete my citrus look, I picked the Ann Taylor Lemon Drop sundress and Damaris Canvas wedges. The dress is a yellow joy and pure fun in the sun! Classy style with a squeeze of juicy lemon. Flattering silhouette with pretty pleated skirt and delicate spaghetti straps at the back translate into a sunny, feminine statement piece that complements beautifully my lemony bag. The Ann Taylor espadrille-inspired wedges are yet another sunny splash of yellow. The same mélange of leather, canvas and jute fiber make these shoes a perfect companion to the purse. What is “jute”? It’s a natural, long and shiny vegetable fiber, also called “the golden fiber” for its color. It can be spun into strong threads and is second to cotton in popularity and amount produced. Historically, it comes from the area of Bangladesh which, together with India, remains the main jute producer in the world. Jute is 100% bio-degradable and recyclable. As the demand for the natural fibers increases, jute becomes more common in the fashion industry. However, it needs to be handled with care as the threads may fray or come loose overtime. Still, I love this natural component that adds this “raw”, organic touch to the wedges and the satchel. Combined with the luxury of leather, it conveys a visually striking image and adds a palpable textural dimension. To make this lemon look complete, I still squeezed few drops of citrus jewels: Kate Spade Lemon Tart drop earrings and Lemon Tart charm bracelet. The earrings feature cute lemon wedges with sparkling stones and white glass pits. The bracelet is an exquisite collection of juicy charms: enamel lemons, shiny starfish, faux pearls and pave crystals, all connected through a 14-karat gold chain. The goldtone ring (Avon, similar) with a pearl pairs perfectly with the bracelet. The other ring (JCPenny, similar) is a yellow glass flower and the other bracelet (Bonton, similar)- a chain of citric, glass stones glistering in the lemony, September sunlight. Although the calendar fall season is around the corner, the strong sun and high temperatures tell me it’s not the end of summer yet here. With a splash of lemonade and citrus, sunny spirit, I hope to enjoy these summery days for another couple of weeks at least! And what about you, did you already say goodbye to summer? I have to say the fruit trend is really fun and I love how you styled this. So sunny and bright! I didn’t know you were going to NYFW…aahh we should have met up. I went on Saturday. Awww the images are strong and amazing! Adore yellow!